Considering we have made no significant progress in space travel since the 60s, we could be about to enter a new era of space exploration. Not only will the new space race change the world forever, but the privatization of space technologies could save mankind. May 31, 2012 - The SpaceX Dragon cargo craft is suspended in the grasp of the Candarm2 robotic arm some 240 miles above Earth. Private space travel was effectively illegal until 2004. Then came along the Commercial Space Launch Amendments Act of 2004, which ripped away the limitations of space travel and effectively allowed private resources to be funneled into the exploration of space. It was just over 11 years ago that NASA opened its doors to the private sector, and since then we've seen some amazing advancements in space technologies. Private spacecrafts have launched -- and returned -- to Earth. 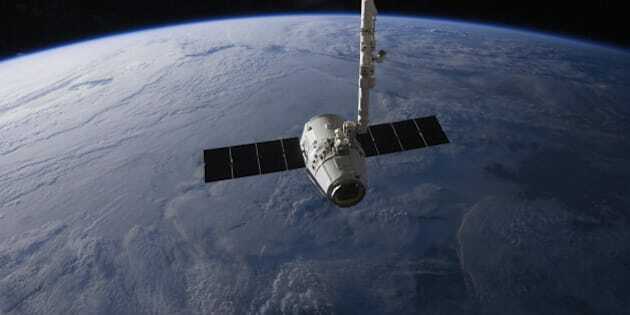 Elon Musk's SpaceX has restocked the International Space Station. And again thanks to Musk, we might only be a few years away from sending a manned spacecraft to Mars. Considering we have made no significant progress in space travel since the 60s, we could be about to enter a new era of space exploration. Set phasers to stun, this should be pretty amazing. Not only will the new space race change the world forever, but the privatization of space technologies could save mankind. In a recent interview with GQ, SpaceX founder Elon Musk spoke about why it's important that we don't dilly-dally when it comes to space travel. "I don't think we can discount the possibility of a Third World War." he said. And if that happens, the window to get off Earth closes. Musk also summarizes the importance of having a cosmic back-up plan in case of emergencies. "You back up your hard drive... Maybe we should back up life, too?" So, how could the private space sector save mankind? Asteroids, and more specifically, the asteroid belt, are loaded with minerals that are hard to find on Earth. Asteroid mining, recently made legal in theory, could provide us with the resources we need to avoid practices harmful to our environment, like fracking. On a smaller scale, solar power obtained through space is far more powerful (due the proximity of the sun) than anything we can currently harness on the surface of Earth. By investing in space exploration, we could outsource our efforts to minimize the harm we're currently wreaking on our natural resources. Asteroid mining and solar power are just some of the theoretical solutions to our energy crisis. Colonizing Mars is one way to combat an overpopulation crisis. But moving beyond that, it's likely that Mars is our only chance of surviving as a species. NASA administrator, Charles Bolden, spoke about why Mars could be our only hope. "If this species is to survive indefinitely, we need to become a multi-planet species," he said. "So one reason we need to go to Mars is so we can learn a little about living on another planet." His sentiments are echoed by Musk and anyone paying attention to the current political shitstorm headed our way. Religious extremism and science have never played well together. Our sun is a mortal resource. Eventually, it's going to go big-bada-boom. And unless we have figured out how to live on another planet, we'll be going boom along with it. Mars would only be our first stop in continuing our efforts to reach out into other galaxies. If we manage to set up base camp there, we could eventually use it as a springboard to explore the farthest reaches of outer space. The death of the sun isn't an immediate problem. The sixth holocene, climate change, nuclear bombs and rogue asteroids are more likely to wipe us out well before the sun turns into a red giant. Back to the wayward asteroids. As we know, it's likely that the dinosaurs met their demise due to the Cretaceous-Paleogene extinction event. Asteroids, specifically near-Earth objects (NEOs), could wipe out all life on Earth. We're already developing technologies known as Asteroid Impact Avoidance (AIA) to mitigate the possibility of being smashed by a giant rock hurtling through space. AIA focuses on destroying a NEO before impact. Although NASA has resources devoted to researching this, without the cash money to pull it off, we're pretty much sitting ducks. But thanks to the privatization of space technologies, the private sector could devote more resources into AIA, and potentially thwart the annihilation of our planet. By the laws of probability, it's highly unlikely that we're alone in the universe. Stephen Hawking thinks that an intelligent species could be our destruction. So, why go looking for them? Well, as it stands, we're likely to blow ourselves up whether we go to space or not. And maybe the only way to achieve peace on Earth is to find a bigger enemy. Like aliens. The racial-religious divide will close exponentially if E.T. starts shooting up the solar system. Or maybe we'll find a tiny green dude who will teach us all a little chill. Either way, we're tanking down here. It's probably time to cut our losses and peace out. There's been a lot of Reductio Ad Hitlerum when it comes pontificating about the future of American politics, especially if the GOP claim the throne. But considering that the Republican party are the only political party in the free world who pooh-pooh climate change, the future can look especially bleak for those of us who believe that the best parts of humanity are rooted in our exploration of the scientific. But sometimes in our darkest hours, we can latch onto our imaginations to provide some much-needed escapism. And what can be more escapist than dreaming of traveling across the galaxy? There might be some very dark times ahead of us. We don't really know where the chips will land. It's all turned into a big crapshoot. But while we're here, we can still look up and throw our dreams amongst the stars. They might be our salvation one day.